Brú na Bóinne - Archaeological Ensemble of the Bend of the Boyne consists of 3 large and 37 small burial mounds or passage tombs from the Neolithicum. The complex dates from 3300 - 2900 BCE. It has been made a WHS because of its artistic value and its size (the biggest remains from the Neolithic era in Europe). The three most well-known sites within this complex (called Brú na Bóinne in Irish) are the impressive passage graves of Newgrange, Knowth and Dowth. On a cloudy Saturday I took a bustour from the Dublin bus station to the Boyne Valley. The first half of the tour was dedicated to early Christian Ireland. First we admired the 10th century crosses at Monasterboice. After that we visited Ireland's first Cistercian Abbey (Old Mellifont). A very articulate female guide made this part of Irish history come alive. In the early afternoon we finally arrived at the main destination of the day: Newgrange, part of the Archeological Complex at the Bend of the Boyne. Sightseeing there started at the Visitor Center, where a simple exhibition is shown about the daily life of the people who build the structures. The explanations are very specific about the site predating Egypt's Piramids and Stonehenge (that last one must give the Irish some extra pleasure). When I checked the dates of some other prehistoric WHS (of which there are many), the funerary monuments of the Boyne Valley are from about the same age as the first Megalithic Temples of Malta and the Heart of Neolithic Orkney. Access to the tombs is only allowed with a guide. A small bus takes you there, the mounds are situated amidst agricultural lands. Only little is known, much speculation surrounds this site. 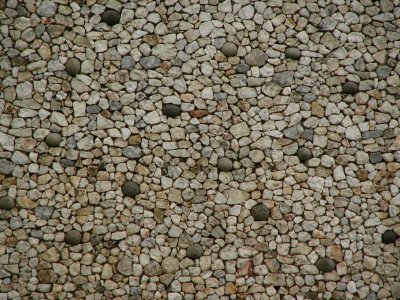 The stones that were used come from different areas, some from quite a distance. The way they are presented now is the result of the restorations of Professor O'Kelly in the 1960's and 1970's, a reconstruction that has been criticized. We were split into two groups to get a look inside. It still is a very crowded experience with 25 people. After entering along a low passage, there is a room in the shape of a crucifix. Some of the walls are adorned with prehistoric drawings (and 19th century graffitti). The guide explains the phenomenon of the sun light reaching the altar directly on the winter solstice. Like at Stonehenge, there are many astronomical stories connected with this site. A tour like this only gives you a glimpse into this era and the way humans lived and thought at that time. I think it's recommended to also visit the nearby site at Knowth (reached from the same Visitor Center) for a more in-depth experience. 3) Almost all materials used in the construction of the site had to be transported from afar. Each material was transported from a different location. The furthest location had to be the Alps, which suggests that commerce on quite a large scale already existed in neolithic society. Closer links probably existed with Orkney, which also features evident cultural similarities. 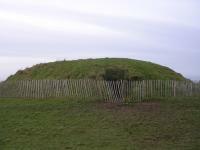 4) The site consists of three locations, each with its own passage grave. 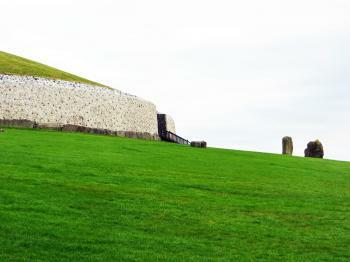 Although the most visited one is Newgrange it is neither the largest nor the most impressive one. This honour belongs to Knowth. I would warmly recommend visiting both. 5) Unlike Knowth and Newgrange, Dowth is privately owned and at the moment cannot be visited. Work is underway for it to be opened to visitors. 6) Several unexcavated tombs can be seen in the area. Currently due to lack of funds there are no plans to excavate them. 7) Knowledge of the holy status of these tombs remained for thousand of years until the Christian period. 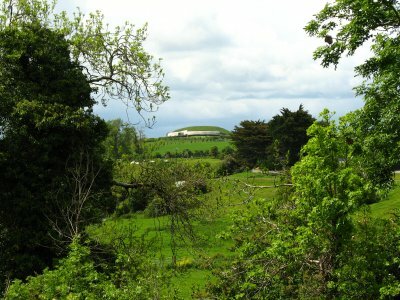 The Romans paid their tribute in the form of a buried treasure next to Newgrange. In Knowth some signs of iconoclasm are visible. Four Christian kings of the 8th and 9th centuries had some of the slabs defaced and their names written on them for everyone to know. I visited Bru na Boinne by public transport from Dublin. It is easy to take the train to Drogheda (30-60 minutes from central Dublin, trains travel about twice an hour). From Drogheda I took a taxi to the visitor centre (15 Euros each way). 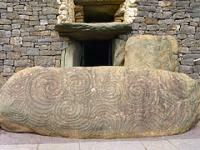 If you come early in the morning you will find a spot at tours for both Knowth and Newgrange. Funnily, sunny days see less visitors than rainy ones, said my guide. Within an hour of leaving Dublin's international airport, my friends and I found ourselves within the beautifully bucolic Boyne River valley, home to the neolithic history encapsulated in the Brú na Bóinne - Archaeological Ensemble of the Bend of the Boyne World Heritage Site. We arrived at the visitor center as soon as it opened in the morning, and were thus able to secure a visit on the earliest tour to Newgrange tomb. 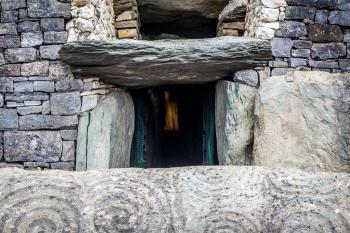 The visitor center is an excellent way to prepare for a visit to Newgrange, with exhibits on the life of local inhabitants from around 3200 B.C., and a replica of the tomb passage and chamber that is wheelchair accessible. After we toured the visitor center, we boarded a bus which took us to Newgrange tomb, which sits atop a hill overlooking the verdant Boyne River valley. I enjoyed the walk back in time through the passage to the inner chamber, where the guide helpfully turned off the lights and provided a simulation of what the light would look like when the sun is lined up with the tomb entrance at the winter solstice. I also appreciated the stone art, including the spirals carved into rocks inside and outside the tomb. A visit to Brú na Bóinne is an excellent introduction to the rich history of the Emerald Isle. Logistics: Brú na Bóinne is situated in the Irish countryside, and is most easily reached by automobile or other private transportation. Day tours with tour companies departing from Dublin are an alternative option for visits. There are a few places that make up the site but I decided to see it by visiting Newgrange - which is the easiest to get to, the most popular and (probably) the most interesting. I found the easiest way to get there without a car was to jump on one of the coach tours that go out there each day. It also means you are guaranteed a spot in a group tour of the site when you arrive. You need to go in with a guide so if you just turn up, you may have to wait until there's a spot. The site itself is quite interesting from the outside, although it was 'reconstructed' in a way that experts thought it would have looked. The real highlight, though, is when you go inside. The detail in the rock carvings is incredible and it has been so well preserved after all these millennia. There's a good demonstration of how the sun would look during the solstice - gosh it would be quite an experience to be inside the cavern for that!! 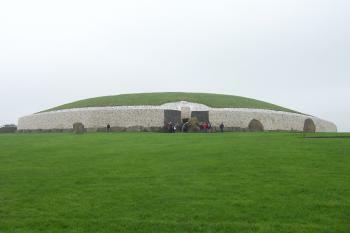 I visited this WHS in July 2012 and was expecting Newgrange to be the highlight of my trip. By all means, Newgrange is well kept and the triathlon entrance, spiral engravings and the watertight interior make it an incredible site. The young local guides are making a good job there. They also switch off the light inside to simulate the winter solstice sun rays creeping in and lighting the whole place. However, the surprise and real highlight of my visit was Knowth. Knowth comprises a series of well-restored prehistoric passage tombs which really show that this place was considered to be a very special and important place. I could notice the many similarities with the neolithic temples of Malta and indeed several studies were made and are still being made to compare these extraordinary sites. In the main passage tomb of Knowth, an ornate flint macehead or pendant was found and it can be seen in the National Museum of Archaeology in Dublin. It is almost impossible to even make a scratch on flint without machinery but incredibly enough this artefact was neatly engraved and decorated! Older then the pyramids and still holding up fine...of course with a little restoration on the side. The Bend of the Boyne is a fabulous archaelogical site, and is truly one of the highlights of any trip to Ireland. Despite crowds at the visitors center and tour buses aplenty,the actual site is not at all overrun; with only a limited amount of tourists allowed in each day. 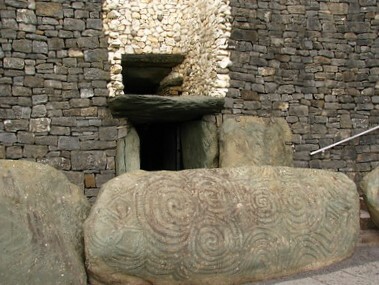 The site itself is composed of three section: Newgrange, Knowth and Dowth. Dowth is not open to the public. I visited both Newgrange and Knowth, and while I must agree with the reviews below that state that Newgrange is phenomenal, I must put in that Knowth is even better. Newgrange is composed of a single (albeit, large and spectacular) burial mound, but Knowth has over 40 different burial mounds. Furthermore, the biggest mound at Knowth is 33% larger then that at newgrange. Added to this, Knowth also contains remains of medieval cellars (Souterrains) which are interesting. But what really sets Knowth apart from anything else is the rock art. Dating from 5000 B.C., there is a phenomenal amount of scribbled swirls, loops, and crescents on the rocks that surround the base of the largest mound. Truly a treasure. I was so over-awed after a visit to Newgrange that I began to create my own miniatures. www.ballybegvillage.com/newgrange.html is where they can be seen. This was my second Neolithic site in a week and it had Stonehenge to match up to, and I can safely say that it did! I am not really a big prehistoric site fan but this was pretty spectacular. We were told that the main passage-grave Newgrange is actually the oldest building in Europe, and after I have racked my brains I can't think of anything older! It predates Stonehenge by a good 1,000 years. The outside is much restored but it has been done very well, and many of the other sites have not been touched so you do have some idea of what it looked like pre-renovation. The inside though has been pretty much untouched since being completed about 5,200 years ago impressive stuff! The burial tomb in the centre is actually quite a calming place after the tight squeeze through the passage, a few of the stones have intricate Celtic carvings especially on the right hand side as you enter. Inside you have a brief display of the course of the sun as is seen on the winter solstice, which adds to the experience. Unfortunatly I was not able to get to the other two main sites at Knowth and Dowth which show what the sites would have looked like before the extensive restoration. I visited the site on a day trip from Dublin, and despite having a bit of a fear of organised tours and the herding that comes with them I had a really good experience and would very strongly recommend anyone coming up from Dublin to hunt out Mary Gibbons tours (www.newgrangetours.com) as they are excellent and do a great job of weaving Irish history into a much broader Western European context, and they also guarantee entry to Newgrange which is a good guarantee to have as numbers are strictly limited. If you are doing it independently there are busses that run to the site from Drogheda (on the Dublin to Belfast motorway) four times a day or one direct from Dublin. You will have to go the excellent Visitor centre to gain access to the sites and will be transported from there on a guided tour, the only way to see the sites! Blessed with sunny December weather, I made a day trip to the Bend of the Boyne during a visit to Dublin in December 2004. Not wanting to have the hassle of driving, I chose to join a tour that would hit some of the highlights for me. Unfortunately, it was the winter solstice, so Newgrange was reserved for dignitaries and other more important people than I. This meant, however, that the tour was able to go more in depth into some other passage graves, ancient abbeys, and other Stone Age sites, such as Four Knocks and the Hill of Tara. Very pleasant way to recover from a Dublin-induced hangover. Dowth, Knowth, Newgrange in the valley of the Boyne. Tara. My friend & I travelled to Ireland for 2 weeks in July of 2002. We started at Newgrange and then went on to Carrowmore, Carrowkeel, the Burren. I highly recommend visiting them in the sun or rain. Rain makes them even more special. High clearance vehicle for Carrowkeel. 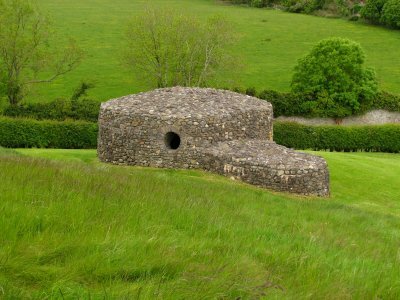 Visit www.megalithomania.com for pics and info on megalithic sites throughout Ireland. Iconoclasm: Four Christian kings of Brega desecrated the central mound of Knowth during the 9th century. Buried treasures: A treasure of Roman coins and other artefacts was retrieved in Newgrange. Historical Graffiti: "There is evidence to show that Newgrange was plundered by Danish raiders about the year 860. Graffiti in the tomb dates back to the 7th century, a subject of great interest to historians." At Knowth as well. Also: Newgrange was re-discovered in 1699, visitors scratched their names. Secret Locations: Numerous underground passages were probably used as shelter during battles. Unusual Entry Requirements or Restrictions: New Grange tomb. Entry on the day of the winter solstice is limited to c 50 winners of a lottery (from some 30000+ applicants!). Located in a Former Capital: Knowth served as the capital of Brega in the 9th century. It became the capital of united Ireland in the 10th century under Cormac MacMaelmithic.